NEWCASTLE, Australia — Kevin Rudd can ratify all the Kyoto Protocols he likes, but if he doesn’t quit coal, we’re screwed. The election of Rudd’s new Labor government here in Australia is being hailed as a watershed moment for this country’s approach to climate change and indeed for global climate change politics. Rudd was sworn in on Dec. 3, and his first act was to ratify Kyoto, which assigns modest carbon emissions caps to the world’s wealthy nations. When his government attends the December United Nations climate talks in Bali, it will mark the first time in more than a decade that Australia attends the annual gathering not as a foot-dragging antagonist, but as a constructive participant. A defining characteristic of the 11 long years of the government of outgoing prime minister John Howard was its denial, obfuscation, fear-mongering, blame-shifting, campaigns of mis- and dis-information, and steadfast refusal to accept targets to cut greenhouse pollution even as Australia came to be scorched by an unprecedented drought driven in part by climate change. which is making our island continent hotter and drier. Unfortunately, the complete failure of the Howard government on climate change made it possible for the Labor Party to win the election without really offering an inspiring alternative. Yes, we ratified Kyoto. Yes, we’ll set ourselves a 20 percent renewable energy target and a 60 percent long-term greenhouse pollution target. Neither of these targets is adequate to the task at hand though, and we still have no short-term pollution target. The most devastating failure of all is Labor’s enthusiastic support for Australia’s biggest polluting industry: coal. Burning coal for electricity produces half of Australia’s entire domestic greenhouse pollution. We are also the world’s biggest exporter of coal, and the emissions from our coal exports exceed our entire domestic greenhouse footprint. Worse still, our coal exports are increasing much faster than our domestic emissions, with all major coal ports in Australia undergoing major expansions. Both major political parties support these expansions. Fossil fuels produce about 60 percent of total global greenhouse pollution, converting fossilized carbon into active atmospheric carbon, which stays in the air forever (in human terms). 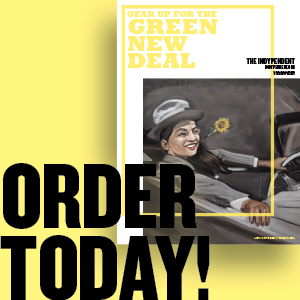 It is simply inconceivable that human societies can reverse climate change while still burning vast amounts of fossil fuels, but that is exactly what most government’s around the world will have you believe they can do. Kyoto ratification should no longer be the yardstick for a government’s commitment to solving climate change. Kyoto’s targets are hopelessly weak (Australia’s target is an 8 percent increase in emissions from 1990 to 2012), and the protocol contains major loopholes, such as carbon-trading arrangements that allow rich nations to buy their way out of real pollution cuts and impose timber monocultures on communities in the global south. A government nowadays should have to meet much stricter criteria to call itself a leader on climate change. For example, does it accept that rich countries are historically responsible for most of the elevated carbon levels in the atmosphere, are still responsible for the highest emissions per capita, and therefore must make take the first and biggest steps to cut pollution? Australia’s per capita emissions are among the highest in the world (higher even than the United States according to some studies), and that doesn’t even include coal exports. While politicians in Australia and the United States often point to China and India as the villains of climate change, China’s per capita emissions are less than one-fifth of our own. India’s are less than a tenth. In general, the developed world’s per capita emissions are four times that of the developing world. If you consider historical emissions, the difference is starker still. 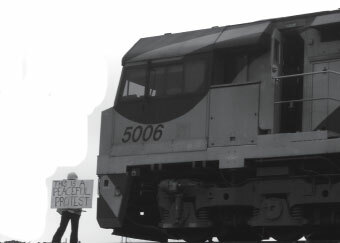 Many climate activists in Australia have already been begun drawing attention to these issues and are reframing the climate debate from “skeptics versus believers” to the far more potent “fossil fuels versus solutions.” In the lead-up to the election, various groups used direct action to blockade coal ships and trains and a power station in Newcastle as well as a power station in Victoria, to put the issue of coal on the political agenda. The new Australian government, on the other hand, has pledged to hand over more than $500 million in public money to coal corporations to sink into the misnomer called “clean” coal — burying greenhouse pollution underground. The many problems with this “sweep it under the carpet” approach can be largely boiled down to two points: we don’t know if it will ever work, and if it does it will be too late. The big challenge facing the climate movement in Australia now is to turn public concern over climate change into a recognition that both sides of major party politics are utterly failing us, and then turn that into an irresistible demand for an end to the usage of fossil fuels. Steve Phillips is a grassroots climate activist in Australia and member of Rising Tide Newcastle. For more information, see risingtide.org.au/.